"It's All They Live For" Comic. Artist's comments: As always, a decrepit old man teaches you how to use a sword in the beginning of the game. It seems a bit redundant at this point, though, but I don't suppose decrepit old people have anything better to do than harass children.. HD Wallpaper and background images in the The Legend of Zelda club tagged: link legend of zelda old men it's all they live for hail-nekoyasha comic fan art. LOL Phantom Hourglass is fun. But why do you need to learn sword-fighting? OMG Yes this is exactly what I feel like when I play that game! 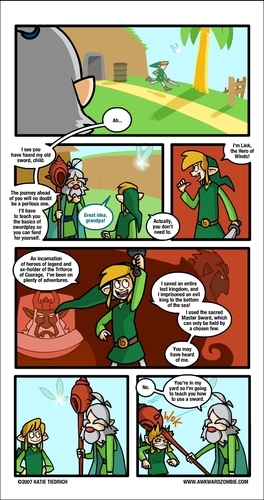 OMG that was my first zelda game i ever played!! it sooooo got me hooked!